An article by Sr. Principal, Mike Cummings, was featured in October issue of FilmJournal magazine, titled “Destination Entertainment: Preserving the social experience in a streaming world”. In the article, Mike Cummings discussed the view of the cinema going as a socially infused entertainment experience. He talked about the benefits of movie-going in this modern world of media streaming as a fun and pleasant way to get away, socialize and enjoy the surrounding atmosphere. See how well thought-out design and latest technology tie into the successful process. Longstanding businesses have been disrupted by new technology companies that provide previously unachievable levels of customization and on-demand products and services. Consider Apple and its completely revolutionary impact on the music business, or Amazon providing us the ability to find anything and order it online and have it delivered to our front door. Netflix is most commonly mentioned in the discussion of the end of the movie theatre. There is merit to the convenience and flexibility of the Netflix ‘in-home” model as a serious threat to movie-going. However, this does not consider the social experience of the movie theatre. You cannot achieve the same level of emotional response by yourself that you can in a group. It is always funnier with shared laughter, sadder with shared tears, and scarier with shared gasps. 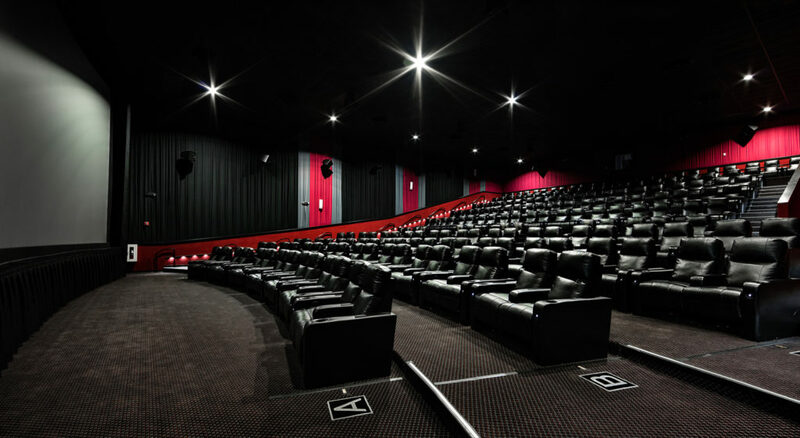 Cinema and exhibition have rightfully been focused on providing presentation and technology that is not available in the home for the vast majority of people. This has created a Hollywood model matching tent-pole movies with the big screen. This portion of the business works, but only if filmmakers are providing good movies and compelling stories. Cinema exhibition is one of several industries impacted by online business disruption. The most prominent is retail. Some brick-and-mortar retail stores are failing, a lot more are struggling, while some are still thriving. The International Council of Shopping Centers published their “Envision 2020”report on the future of the shopping center industry. Among the findings are that a “hybrid form of commerce is emerging, where shoppers move seamlessly between physical and digital worlds of retailing as they research products and make purchases.” Shopping centers are evolving from simple retail properties into shopping, dining and entertainment centers that are central to, and fully integrated with, the communities that surround them. The role of cinema in creating a shopping, dining and entertainment center serving as a community center and cultural hub is absolutely critical. Let me provide some statistical basis for my optimism. Verizon prepared a report on Millennials and entertainment in 2014 that provides a broad perspective on preferences and some good news for cinema. Millennials’ top three preferences for entertainment are to watch a TV program they like, listen to music and watch a movie they’re interested in. Most have a subscription service like Netflix, but the report also clearly shows very low tolerance for any audiovisual problems along with a strong preference for higher quality. Other high-ranking entertainment preferences include interacting on social media, gaming on a gaming console and a wide variety of fantasy sports. I think all of these are considerations for turning the cinema into an entertainment destination. The MPAA 2017 Theatrical and Home Entertainment Market Environment (THEME) report also includes encouraging statistics. Theatrical still accounts for 46% of combined theatrical and home entertainment spending globally. Digital home entertainment is growing significantly, theatrical modestly, and physical home entertainment spending is falling. Frequent moviegoers continue to drive theatrical business, accounting for 49% of ticket sales while representing 12% of the population. Diverse age and ethnic groups are rapidly becoming frequent moviegoers. Entertainment center functions like laser tag, arcade games, bumper cars and boutique bowling. All of these functions merit consideration. eSports. I saw a very interesting installation of MX4D in the TCL Chinese Theatre in Hollywood that also serves as an eSports venue. It hosts competitive eSports tournaments during part of the week, with lots of spectators, and delivers an immersive EFX alternative movie experience the rest of the week. eSports fits within the Millennial entertainment preferences from the Verizon report and represents a tremendous opportunity. The multi-use of the auditorium is another compelling business plan. Event Cinema. Design an auditorium to also function as an event space for concerts, sporting events, premieres, and other more creative uses. Social Gaming Spaces. Create a dedicated competitive gaming space surrounded by socializing space for spectators as well as to encourage food and beverage sales. Alternative Content Hub. Create a Netflix or YouTube red lounge surrounded by small, intimate venues for friends to share some of their favorite content. Some people will reject this idea outright, but these are among the favorite brands of Millennials and represent a real opportunity. There are business challenges to this idea, but more unlikely alliances have happened. VR and/or AR. Virtual reality (VR) is a very different kind of social experience than traditional moviegoing. Each participant is having an individual experience. The social part happens when you have people watching the participants. I saw an example of this at BIRTV. There is good news out there, and there are some great opportunities. We can learn from retail’s challenges and build a better mousetrap. I hope this prompts you to think about design as a tool to create a social hub for your community.